With the remains of over six million people, the Catacombes de Paris has been called the world’s largest grave. Update: on 17 April 2019 at midday the venue posted on their Facebook page that the estimated queuing time is more than three hours, without a guarantee of entry. Why waste three hours of your time in a queue? Get there early, and get a skip-the-line ticket. Although named after the catacombs along Rome’s ancient Appian Way, the catacombs in Paris are much younger. 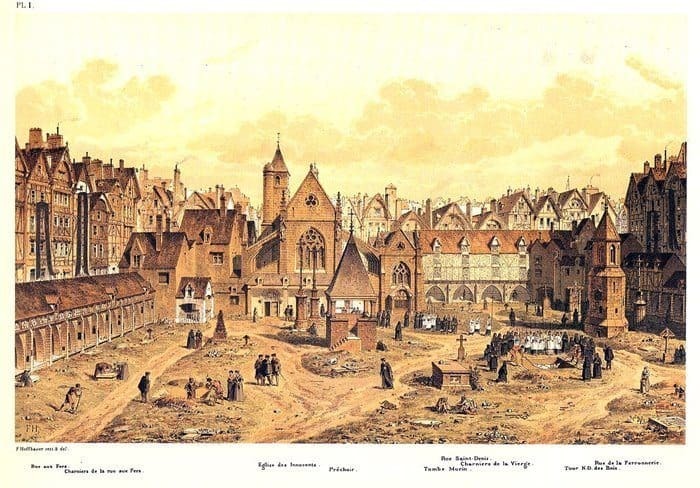 The first human remains were transferred from the Cimetière des Saints-Innocents to the quarries that lay beneath the streets of the city in 1786. Following centuries of use, out of space and causing the spread of disease, the cemeteries of Paris were then closed. In all the bones of an estimated six million individuals now lay in what is the largest ossuary in the world. Almost immediately the catacombs attracted attention, and notable visits by the future King Charles X in 1787, the Emperor of Austria in 1814, and Napoleon III in 1860 are recorded. An increasingly curious public were given more access, and by 1874 they were give more regular access. 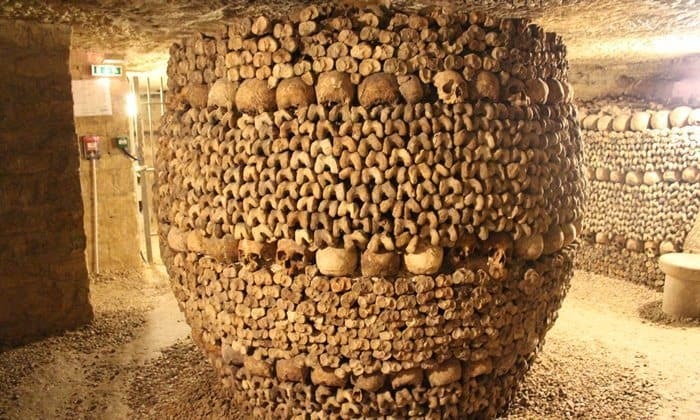 Today the catacombs are one of the more popular attractions in Paris. At the height of the tourist season visitors can queue for up to three hours and more. Anyone who has been, recommends not just buying tickets in advance, but buying skip the line tickets. Here you will find information on what to expect during your visit, details about the conditions and accessibility of the tunnels, as well as tips and suggestions for buying tickets, online and in advance. One of the many arrangements of human bones in the underground passages of Paris. Much of Paris on the Left Bank lies above limestone deposits. This stone had been quarried for centuries, since at least the Roman period and perhaps even the earlier Iron Age. Many of the beautiful buildings we admire in Paris today were built using stone quarried on the Left Bank. The quarrying was quite extensive, and meant that much of this part of the city was dangerously undermined. A number of cave-ins lead Louis XVI in 1774 to call for an investigation into the state and safety of the tunnels. And there followed various efforts to reinforce the underground passages. The urgent need to consolidate the cavities beneath the city’s streets coincided with the need to find a solution for Paris’s overflowing cemeteries. To begin with, bodies were exhumed and placed in charnel houses or ossuaries: structures built around the edge of the cemetery for housing bones. Various attempts to limit the use of the cemeteries failed. The final straw came in May 1780 when the basement wall of a property adjoining the Holy Innocents’ Cemetery collapsed under the weight of human remains in one of these charniers. Although the cemetery was closed immediately, there was still the problem of what to do with the human remains. Particularly those in the charniers. Coincidentally, oversight of both securing the safety of the underground passages and what to do about the closure of the cemeteries fell under the Paris Police Prefecture, and Police Lieutenant-General Alexandre Lenoir. And it was he who proposed the subterranean passages be used to house the human remains from the cemeteries. The proposal was approved and legislated for in 1785. After the consecration of the newly reinforced tunnels on 7 April 1786, bones were removed from the Holy Innocents’ Cemetery and brought to their second final resting place. This relocation took place at night observing religious rituals, where priests following carts laden with bones covered in black sang the service for the dead. By 1814 the cemeteries of Paris had been relieved of their deceased. A drawing of Cimetière des Saints-Innocents in 1550. What is there to See in the Catacombs? 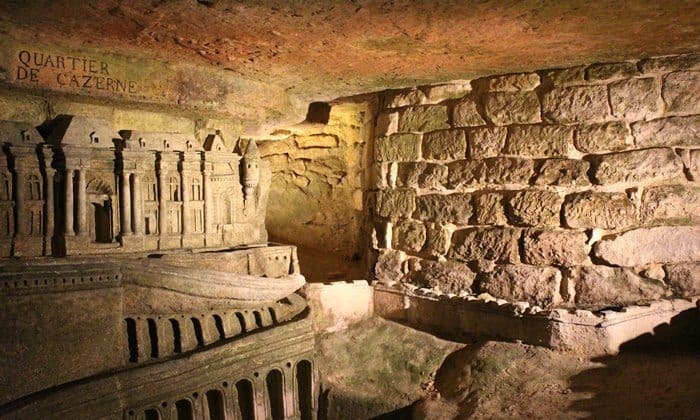 Despite being called the Paris Catacombs and the ubiquitous photographs of human bones neatly arranged in underground passages, the interesting history of these passages means there is more to see than human remains. Being beneath the streets of Paris you get to see architecture of a different kind. After the staircase down, visitors enter a small exhibition area that gives the historical background to the catacombs. Reinforcements of the aqueduct of Arcueil added in the early 1780s following a flooding of the foundations. Underground quarries from which limestone was removed. The so-called Port-Mahon Gallery – carvings in rock of buildings in Port Mahon (Menorca) created by a stonemason who had previously served in the military, and was stationed on the island of Menorca. Following their destruction during the French Revolution, the carvings were first restored in 1854 and several times since. The Cloche de Fontis is an architectural feature that resembles a bell tower. It is in fact an ingenious reinforcement of the quarry’s roof to prevent collapse. Of course the main attraction is the ossuary. Visitors are warned they are entering the catacombs proper with a sign that reads Arrête! C’est ici l’empire de la mort, Stop! This is the empire of the dead. Each of the features listed above can be seen in a 360° walk through of the catacombs. The text is in french, so if you can not read French use your browser’s translate function for a mechanical translation, which is better than nothing. To explore each feature further, Click Here. The tunnels that make up the catacombs are some 30 metres underground. There is no lift, and although the passages are fully lit, people who do not have full mobility are not able to visit. To get down to this level, there are 130 steps, and at the end it is a climb of 83 steps back up to street level. The route is about 2 kms (roughly equivalent to 1.25 miles) in total, but not all of this is made up of the low, dimly lit tunnels that lined with evocative displays of stacked human bones and skulls we see in promotional photographs. A self-guided tour of the catacombs takes takes most people around 45 minutes. And bear in mind, after the vandalism incident in 2009, the custodians of this site take any form of destruction very seriously. And, do not be surprised when at the end of your visit you and your bags are searched. In fact, if you have suitcases and luggage with you, you will not be able to take them inside with you. And given the security issues, you will not be able to leave these at the ticket office. Only bags with maximum dimensions of 40cm by 30cm are allowed and you will have to carry it by hand not over your shoulders. There are no toilet facilities at this site, either outside or inside. 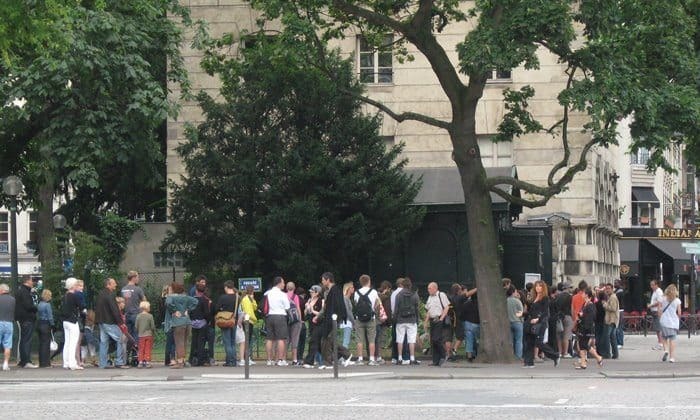 Depending on the time of the year, and whether you have purchased a ticket in advance or not, you may be queuing for as much as two hours before entering the catacombs. Given the nature of this attraction, it may not be suitable for people of a nervous disposition and young children. There are lots of human bones, and skulls on view. And there is no mistaking what these are. Also, it is probably not suitable for people with heart or respiratory problems, and certainly not if you suffer claustrophobia. Children under the age of 14 must be accompanied by an adult. If you are unsure if this is an attraction for you, the following is a video of the entire route through the catacombs. The video is just over 18 minutes with certain sections speeded up, hence why it is substantially shorter than the 45-minute length of an average visit. Please Note: as the route through the underground passages is about 2 kilometres, and visitors move in a single direction, you will not exit the catacombs at the same place as the entrance. Both the entrance and the exit are marked in the map above, and the address of both are listed in the information box on this page. And, yes the address supplied on this page is different to the address supplied by a number of commentators on a popular review site. They are wrong! The address on this page is correct – we have verified it and it is the same as the address as listed on the official website. Purchased at the ticket office, your entry will cost you €12 if you are an adult, or €10 if you qualify for a concession (18 – 26 year olds, and others – see the website for the full list). Various groups of people qualify for free entry, anyone under 17 for example, but see the website for the full list. And ensure you have the relevant, valid identification. For an extra €5, an audio guide is available in French, English and Spanish. Unless you arrive early enough, or go later in the day (after 18h00, but a lot of people try this without success) be prepared for a queue. This is not only a popular attraction, only 200 people are given entry at any one time. Looking at the negative reviews online, all complaints are about the long wait – 3 hours is not uncommon – and there are even reports of 6 hours. Although it is busier in peak tourist season (May to September), there are reports of long queues even in winter. All positive reviews of the attractions suggest that the only way to avoid the queues is to buy a ticket in advance. Buying tickets online, in advance can be purchased via the Paris Museums Official Website. Advance tickets for adults are €27 (includes an audio guide) and €5 for children ages 4 to 17. Be warned, these tickets are not the same as ‘skip the line tickets’. They are just confirmation of a reservation, so you will get in, but with a wait. Not only do all the positive reviewers suggest buying a ticket in advance, they also specifically mention buying a skip the line ticket. Skip the line tickets are available via certified sellers on the GetYourGuide network. 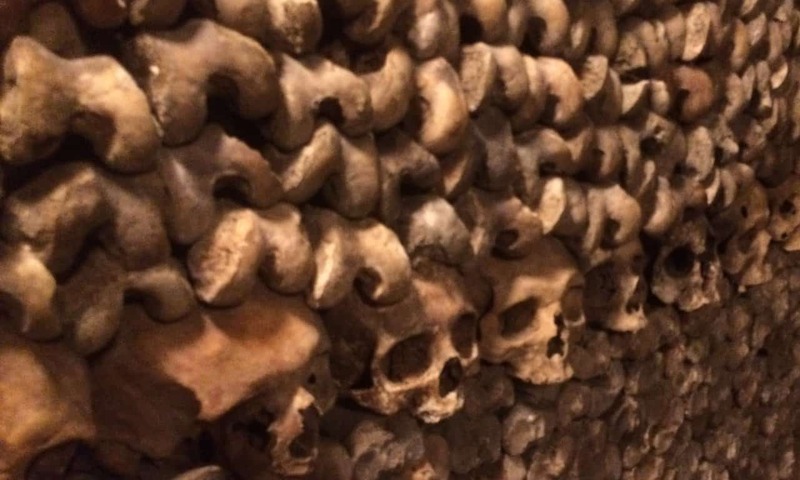 A number of options are available, straight-forward skip the line tickets (with an audio guide included), or guided tours with a knowledgeable guide, there are even guided tours that include the Catacombs and other related sites, such as the Père Lachaise Cemetery. See the full list of tickets and tours for the catacombs. The entrance to the catacombs is marked with a purple pin. As the tour follows a route in one direction for about 45 minutes, the end of the tour is not at the same place as the entrance. The exit from the catacombs is separately marked in the map, also with a purple pin. 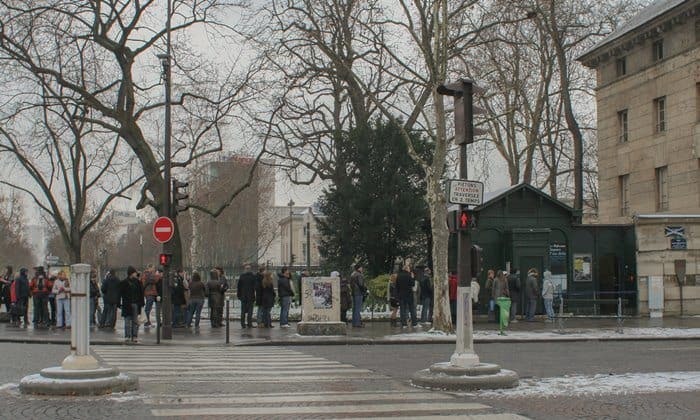 The tabac where you pick up pre-booked (only – you will be required to show the barcode in the email sent once purchasing your ticket online), skip-the-line tickets is marked with a yellow pin. NB: Entry to the catacombs is not included on either the Paris Museum Pass or the Paris Pass. The catacombs are within walking distance of the Denfert-Rochereau Metro station, which is served by lines 4 and 6, as well Line B or the RER. This is also the station where the Orly airport bus terminates. For more suggestions on what to see and where to go in Paris, with more tips and recommendations, see our Paris City Guide. Consider a Paris Museum Pass or a Paris Pass. Wow, I just visited the catacombs, what an amazing experience. I used the link from Archaeology Travel to purchase a ‘skip the queue’ ticket. It was really quick and easy – I was travelling so only had my phone, and that was all I needed. I completed the purchase using PayPal so didn’t need credit card details to hand (although that option is available), received a confirmation email and voucher which contained clear instructions for exchanging the voucher for a ticket at a small tabac shop near the catacombs. All really straightforward. The ticket said from 11am, but I got there at 10.15am and it was just opening, and the ‘skip the queue’ ticket let me do precisely that, straight to the front. It came with an audio guide which seemed to give additional information to the notice boards (although maybe I didn’t read as many of them as I could have). I would recommend the visit (it really is breathtaking), and would recommend getting the ‘skip the queue’ ticket if, like me, you are in a rush. I made the visit and still got to Gare du Nord with plenty of time (although it is worth knowing that the exit from the catacombs is down the road from the entrance, so if in a hurry it is worth glancing at a map). Thank you for coming back and sharing your experience Karina :) Waiting in that queue in December would not be fun – and certainly a waste of time any time of the year!